It was one of those perfect nights to be out fishing a bass tournament. Cloudy sky, calm water, good people. I didn’t imagine for a second I had much chance of winning the tournament, but winning big bass is always possible. Big bass pays about $60 depending on how many boats. There were eighteen boats entered. Eighteen experienced teams that know the lake. For my part, fishing alone, I figured just relax, experiment a bit, try some lures that I know catch bass. Find something that works. First thing I noticed was it didn’t look like Jordan Lake. Someone had moved the boat launch a quarter mile west so nothing looked familiar. At take-off I motored east along the north shore and figured out what happened. I wasn’t going crazy after all. I fished the north shore, not far from the boat launch, concentrating on some emerging vegetation in murky water. 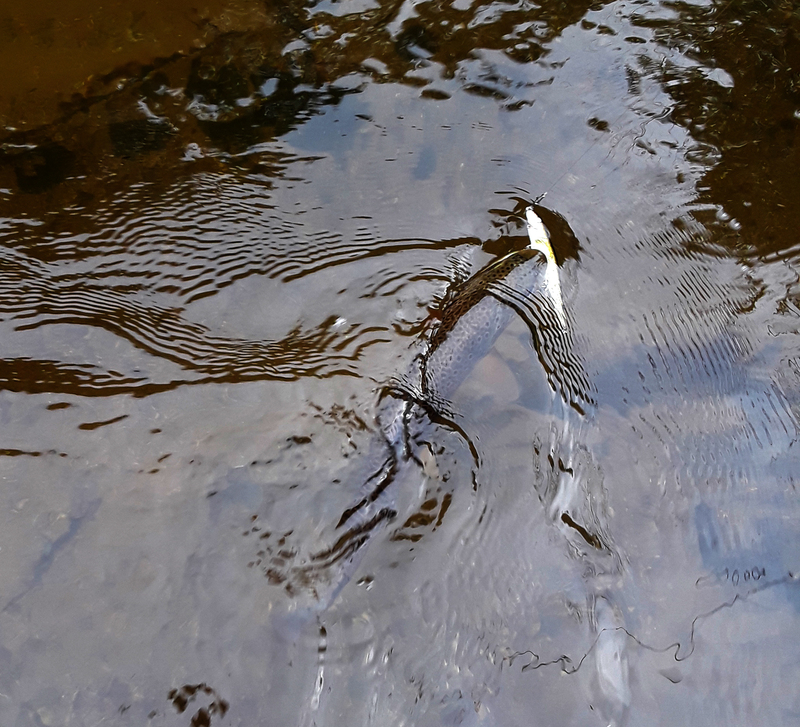 I tried a variety of lures including a spinner bait, a pop-r, a rattletrap, a jig and finally had a nibble on a culprit worm. It took 40 minutes to catch the first fish which was under size (bass have to be 14 inches). I kept tossing the culprit which has a lot of swimming action, but eventually traded that for a Berkely powerworm, which has swimming action but adds scent. I boated three more bass on the powerworm but only one was a keeper, about fifteen inches. Then the fishing died. Had another tap on a worm but didn’t connect. If there is good news, I feel like my worming skills are back up to speed. With one small fish I started thinking about my overall chances, not a good thing. 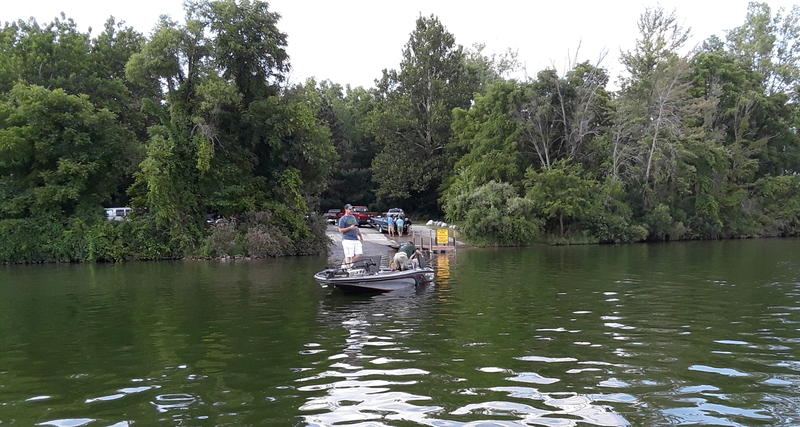 I headed back to the dock at about 9:00 (tournament ran until 9:15). At Reeds Lake last week I waited until everyone else had trailered their boats before loading up myself, mainly because a one-man trailer loading process is tricky and feels like it is taking forever, while others wait. So at Jordan I trailered the boat about 10 minutes early, then released my one keeper bass. I know, I should have weighed in. At least I wouldn’t be listed on the WMB bass website as last place. In the future – no more wimping out! I could have finished as high as 12th place. An improvement over Reed lake. It’s been decades since I fished a bass tournament so it is safe to day I’m not up on the latest lures and techniques. As a much older guy without a workout routine another concern was stamina. Don’t laugh – 3.5 hours of standing and guiding a boat with a foot pedal while fishing is not easy. A third concern was backing my bass boat down the ramp without destroying my neck. So I had a couple reservations but signed up anyway. 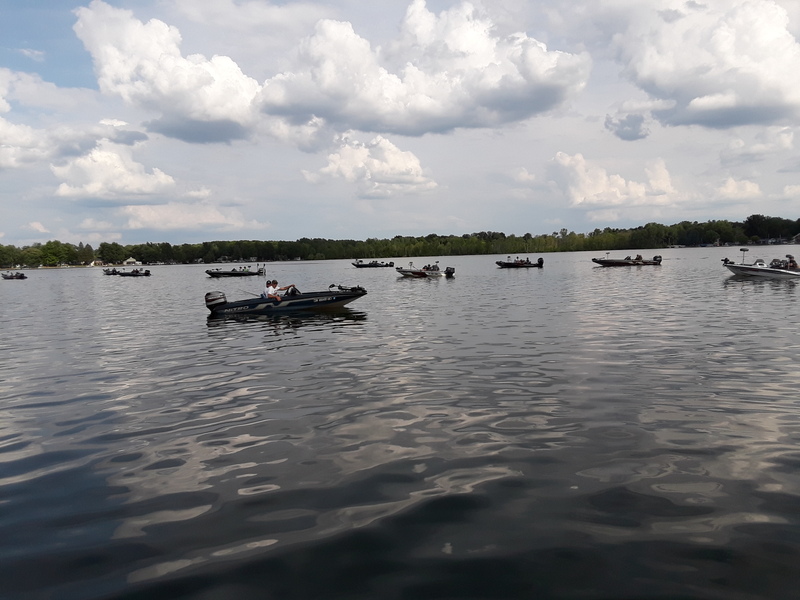 West Michigan Bass, a local club, has tournaments all over west Michigan. Week nights and weekends. If you are a member ($40/yr) you can fish any of the tournaments. You can also join/fish a division which has lakes in your local area. It is all well organized. Their website westmichiganbass dot com automates membership and explains the rules, and posts the results of tournaments next day. Check out their website – it is really well done. So last night I fished a Reeds Lake tournament. Reeds lake is located in the middle of East Grand Rapids and has a nice public park. There’s no beach but residents have a nice spot to just relax and enjoy the lake. 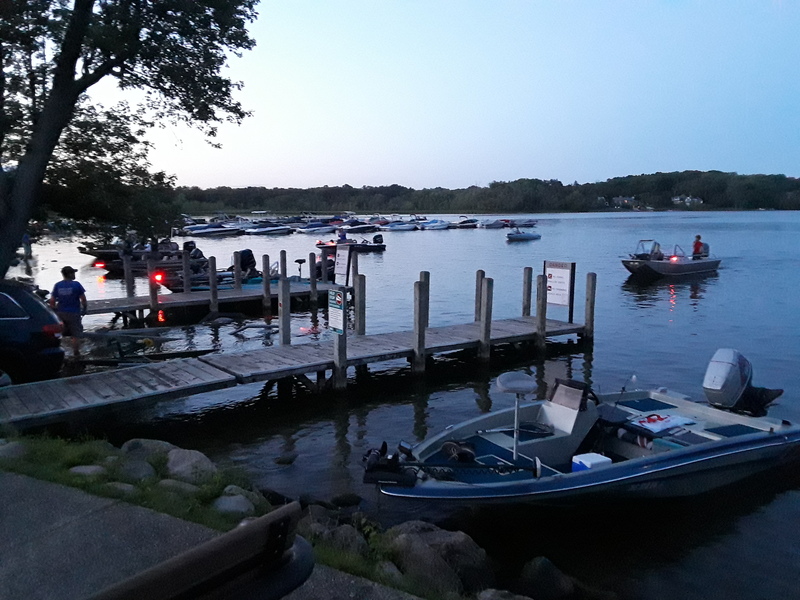 The public boat launch does not include parking so you need to launch your boat then find a spot on the street for your vehicle and trailer. I arrived early and it was not hard to find a parking spot. I received a few comments when I launched my 1980 Nissan bass boat. (In the foreground of the top photo). I think the boat is older than most of my competitors and may have been a novelty to them. The boat still looks good and is fully functional. I did carry a bucket, though, in case the live well pump failed. It did, glad I had the bucket. I started out fishing a cluster dock in front of Rose’s Restaurant. I caught a small fish, just under the size limit and tossed it back. Then fished a weedy flat, more docks, then returned to Rose’s. I never fired up my 90HP Nissan outboard, but should have, just to clean out the cobwebs. I caught one keeper. 2.6 lbs or so, and weighed in at the scales as proof I didn’t get skunked, and actually finished the tournament. 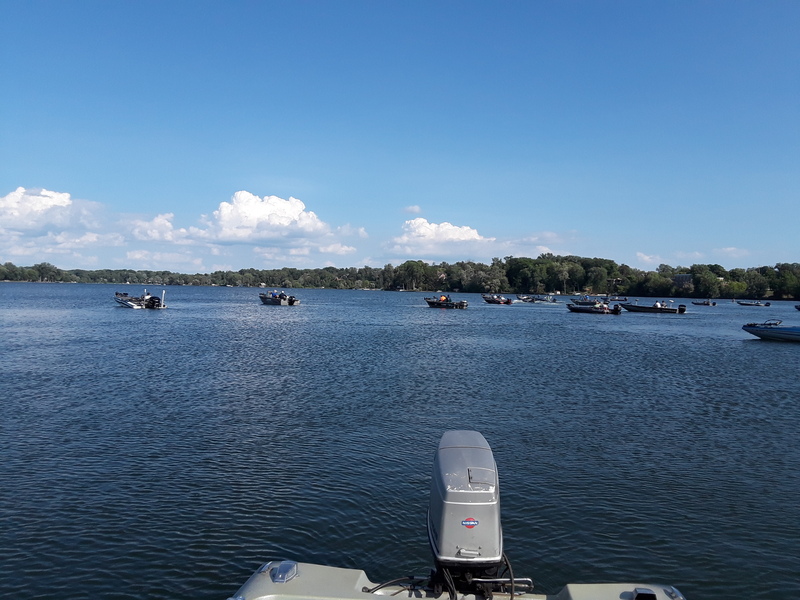 The West Michigan Bass website this morning shows: L. Rude placing 14th out of 18 boats in the “Midweek Therapy – Grand Rapids – Evenings” division. I actually weighed in more bass than four 2-man teams so there is some small consolation in that. I’m a bit sore this morning but feel good about getting out there and competing. WMB ran a great tournament – so a sincere thanks to the guys that organized and ran the sign-up and weigh-in. It couldn’t have been more professional. I have my eye on a Jordan Lake tournament coming up, been years, but that is another great West Michigan bass lake. 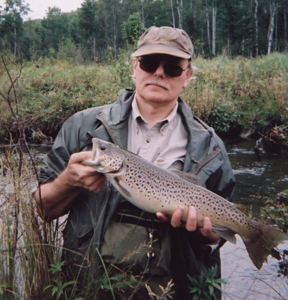 May go trout fishing in the mean time, more good exercise and a trout dinner reward. Denny, a trout camp irregular, sent Feral and I an invite to camp this last weekend with the idea the trout would be biting with the predicted rain storms. I didn’t want to pass on a chance to camp, and maybe play some late night guitar, but there was nothing about the weather report that suggested we might stay dry. So a fun night of beer and guitar was possible, but unlikely. I said yes, we set up camp in a drizzle, and hit the streams. I fished a stretch with Denny on the Little South. It was the first time we shared a stream together in years. I hung back mostly and noticed right off he had the Lucas underhand flip cast down solid. 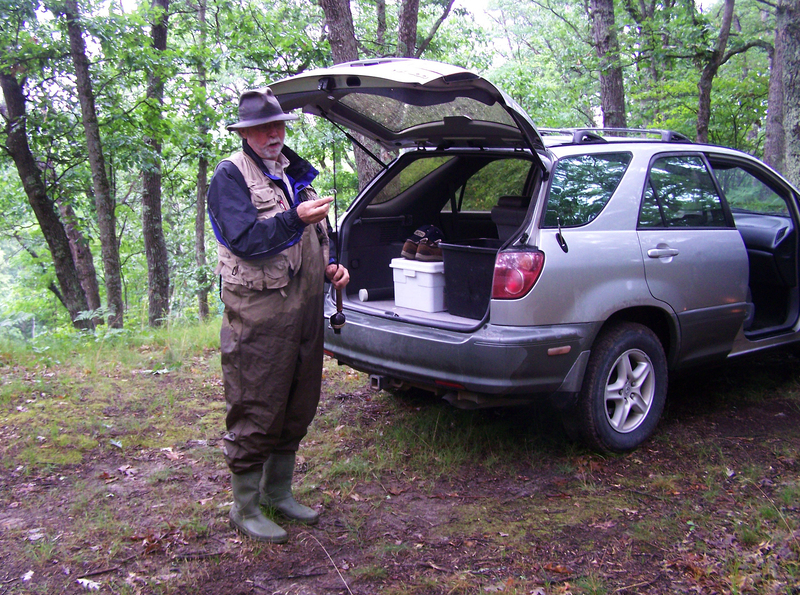 The other thing I noticed was his set-up, a Shakespeare 1810 reel and a spinning rod with the reel seat at the base of the rod. Turns out he modified a standard spinning rod in order to get what he wanted. Spinning rods with long cork handles and sliding rings are getting hard to find, and you pay a lot for them. Denny made do and it worked because he was slinging a bargain bin minnow bait (60 cents!) into tight cover. I have to start looking harder at bargain bins because his lure was convincing. The stream was up a little from summer levels but clear as glass, which is good and bad. The fish can see the lures, and the fish can see you. I hung back mostly watching Denny work the cover and talk about everything. I would never call Denny a motor-mouth because sometimes a motor fails. (ha!) I was entertained. He caught a small keeper and lost one that might have been pretty good. Like a pro he rested fish for a couple minutes if he saw one make a pass at his lure. Basically letting the fish get back to its feeding spot, then making the same cast. Often good for fish. After a night of rain we went back to the Little South, but this time we cut off a couple stretches, with the idea I would meet up with Denny in 2 hours so we could head back and break camp before the 11:00 AM check-out. The morning fish was productive. I caught 3 decent browns and missed a very nice one, probably 18 inches. Denny caught a keeper and saw a good one also. I caught the fish in the photo below which is larger that you might think. That’s a #11, 3-hook Rapala. The fish was probably 15 inches. So Denny and I both have stuff drying out in our garages this morning. And a fun trip behind us. Feral didn’t camp but did show up at dusk, with Jake, his son, to jam guitars but the rain picked up as they pulled in. They hung out for a bit, but no sense standing around getting soaked. Jake has a commission from the city of Alpena for a park sculpture which requires some serious metal working tools and skill. Feral has a machine shop and the two of them are fabricating some pieces for the sculpture on weekends. Denny just returned from Nazareth, PA where he built a guitar in a small class run by Martin Guitar employees. He needs to put on a finish coat before he takes it camping. My thought, some dry weekend let’s try again.